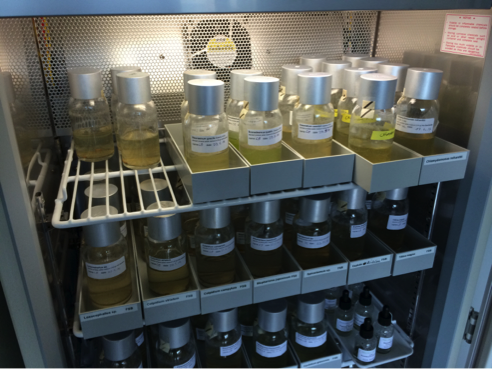 Stock cultures of microorganisms kept in a laboratory provide the organisms required for conducting experiments (Fig. S1). As such, the stock cultures are extremely important resources, and should be maintained in a manner that ensures their long-term persistence. The most important method to ensure long-term persistence is regular sub-culturing, whereby a number of individuals are transferred from an existing stock culture into a new microcosm containing abundant resources for the species being sub-cultured. Frequency of sub-culturing needs to be tailored to the dynamics of each species; usually every two to four weeks is sufficient. Long-term access to protist strains is not usually achieved by freezing (in contrast to bacteria for example, but see section 1.7), though some species are maintained long-term as cysts, and revived when required. This method is not described below. Fig. S1. Stock cultures in 250 ml glass jars with aluminium caps. Each row is a single species, with the most recent subculture in the front, and later ones towards the back. Photo by Owen Petchey. Fresh culture medium, containing appropriate high abundance resources for the species being sub-cultured. Remove the most recent stock culture from the incubator. Estimate the density of the most recent stock culture, from which individuals will be taken to start the new stock culture. Calculate the volume of stock culture containing at least 100 individuals. Prepare the new stock culture in an appropriate vessel. Label the new stock culture appropriately, (e.g., species name, source of species, culture media, person responsible, date). Swirl the source stock, withdraw the appropriate volume of culture, and squirt it into the new stock culture. Replace all stock cultures in the incubator. Discard the oldest stock culture, if necessary. Make sure that at least the second most recent stock culture (i.e. the one used as a source for the fresh one) is kept as a backup. Enter data about the transfer in the stock culture lab book / records. Appropriate media (at least a two day process) and sterile culture vessels should be prepared in advance. Steps 1-6 above require approximately half a day for 20 stock cultures. The following practices can help avoid unexpected or avoidable loss of stock cultures. Redundancy in the form of replicate stock cultures, housed in independent incubators, ideally in different locations. Regular monitoring of stock culture population sizes to prevent extinctions due to population fluctuations and small population sizes. Keeping detailed records about each of the stock cultures, including their population sizes. Having a single person responsible for maintenance of a set of stock culture. Not using stock cultures to seed experiments. Rather, make a set of separate stock cultures specifically for an experiment. Keeping predators on diverse prey assemblages, for longer persistence. Guaranteed long-term persistence of stock cultures. Comprehensive and detailed records, including population sizes at subculture, of each stock culture.